ironSource supports leading ad sources on the Mediation platform. Once you’ve integrated the network adapter in your code and set up the source on your dashboard, you can serve mediated ads on your app based on eCPM prediction and geo. Follow this guide to manage your mediation layer effectively on your dashboard! Make sure you have correctly integrated the ironSource Rewarded Video, Interstitial or Banner Mediation in your application. To set up and activate ad networks to serve through the ironSource Mediation platform, follow this article. Once you log in to your ironSource account, go to ‘Monetize‘ ➣ ‘Mediation‘ ➣ ‘Management‘. Select the group that you’d like to define the ad source priority for; use the search bar to find a specific group or click ‘Add‘ to create a new group and add countries and segments to be included. Creating customized groups of countries and segments can help you to more easily and effectively manage ad sources and compare the predicted eCPMs. For example, by including your best-performing countries in one group (for example ‘Top Countries’), you can more efficiently analyze, optimize, and manage the ad sources of these specific countries within the group. For each group you can individually customize the ad network waterfall and priorities for enhanced flexibility and control over user group targeting and optimization. Once you’ve added groups you’ll have to decide on the group hierarchy. Group hierarchy is important because it’s possible for a user to belong to more than one group, therefore the hierarchy you decided will determine which ad network waterfall that user receives. You will then see the Ad Source Priority options for the selected geo on the right-hand side. All group names must be unique. The groups you define here will only be accessible for the specific application you selected in Step 2. The same country can be included in more than one group. We recommend running on Auto-Optimization, so the mediation algorithm can extract data and estimate eCPMs. Once you’ve selected the geo, you can manage the ad sources delivery priority. You will see the ad networks and instances you’ve activated on the SDK Networks module and can manage them according to preference. The Auto Optimized section reflects ad source prioritization based on real-time optimization through ironSource Mediation algorithm. This means that the ad delivery in your apps from these ad sources will be optimized by highest-ranking eCPM. The Auto Optimized section ensures you always serve the highest paying ads first.To cap the number of ads served by this ad source for a specific instance in the waterfall, click on the vertical ellipsis and define how many ads should be delivered from this ad source. Capping: define how many ads should be delivered from this ad source. This is helpful to allow for a range of ad delivery opportunities from each ad source. 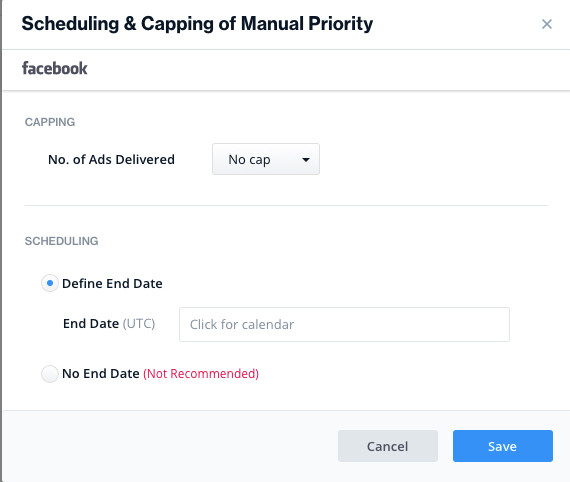 Scheduling: determine when the instance should return to the auto-optimized section. You have now optimized the ad delivery from ad sources on the ironSource Mediation platform.